"When should the harvest begin?" From late August until the end of the harvest, levels of sugar and acidity are analyzed two times per week to determine the maturity of the grapes. The results allow us to determine exactly the right moment to being harvesting – a complex decision that is vital to the ultimate quality of our wines. 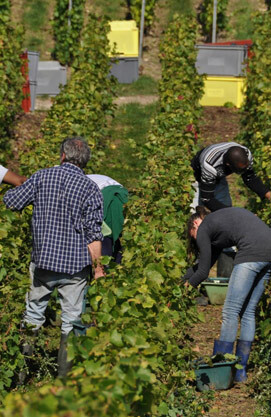 In Champagne grapes must be harvested by hand. Antoine Chiquet pays particular attention to grape selection, transport and the ongoing maintenance and cleaning of equipment. Thanks to these efforts, oxidation of the fruit before pressing is kept to a minimum.